This is the second article of a two-part series. CFN: In the report, you identify several steps that NRCS could take to create the conditions for third-party investors to participate in NRCS programs. You call for an increase in data availability, a focus on outcomes, a return on investment, mitigation of risk, and reductions in transaction costs. Is this what you had anticipated? Bayon: Some of the things we anticipated – and some of the findings were more surprising. If you want to bring in investment, you have to allow for a return on it. And that is a bit different from the way that NRCS has typically operated. A cultural shift may be needed. NRCS was established to help producers on the ground in lots of different ways. This work goes far beyond conservation. The historic emphasis of NRCS is extremely important. It does an extraordinary job of helping producers – particularly small producers. The ideas we were talking about are new. They are different from how NRCS typically operates. To some, there is a sense that there should not be a return on investment. Or there is a perception that these types of approaches will benefit Wall Street or the big players in agriculture at the expense of the small ones. We found that it would take a bit of a cultural shift for NRCS to become comfortable with investment. The report explores places where a return on investment could make sense and maximize the effect of NRCS dollars to producers on the ground. The cultural shift is about a subtle change of mentality. It is about seeing investment – when it is done right – as a way to better help small producers. CFN: The report details opportunities for investment capital to be leveraged through Environmental Quality Incentives Program (EQIP), Agricultural Conservation Easement Program (ACEP), Regional Conservation Partnership Program (RCPP), and Conservation Innovation Grants (CIG). How does that better allocation occur? And is it possible that the practice could become self-sustaining? 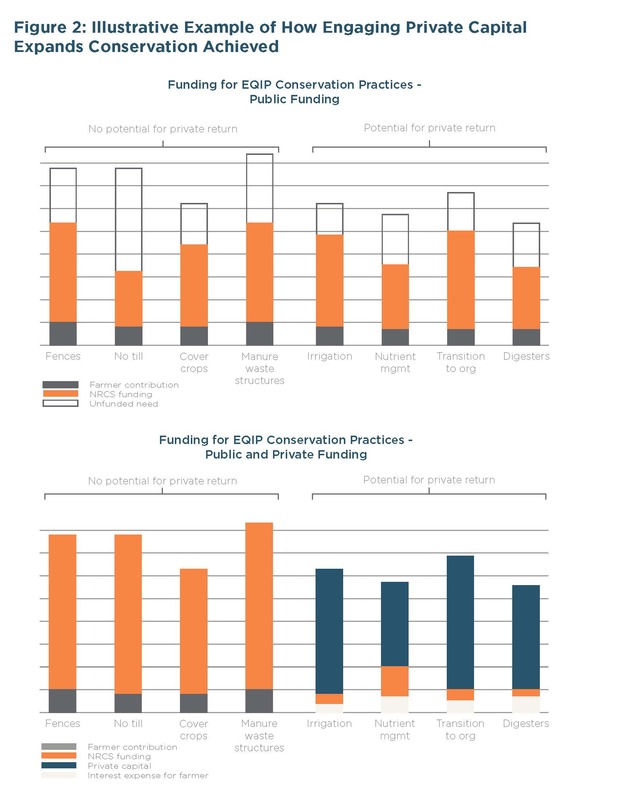 Bayon: We illustrated what is at the heart of this in a graph depicting how conservation outcomes can be expanded with private capital (shown below in Figure 2 from the report). This impacts the concept of self-sustaining programs too. The top shows how NRCS funding currently operates and the unmet funding need. These are requests that have been made that were not funded due to limitations with NRCS’ budget. Reprinted with permission from Encourage Capital. The bottom graph illustrates what could happen if you bring in private capital in some way. The most valuable money we have as a society is the money that government can allocate to anything, regardless of return. So how do we best use that valuable money? Put it to work in those places that do not have an ability to generate a return and let private investors take up the capital need for things that do provide a financial return. This was a fundamental concept of the report – separating out the practices that have potential for investment, figuring out how to drive investment towards them, and freeing up capital for practices that are important but do not have the potential for investment. The graph is not intended to be definitive. There may be ways that you can get cover crops, no till, or other practices to generate returns, but our assessment looked at clear examples where practices can make investment returns: irrigation [improvements], nutrient management, organic transition, and anaerobic digesters. You might dig in on those practices and not find as much potential for a return. Maybe the practice is too difficult or the costs are too high. But the data we have now [show] these seem promising to explore. Our emphasis was on the different ways to drive investment capital and leverage. Some of those ideas have the potential to become self-sustaining, but that was just an added benefit. One way is to use the requirement of matching funds. Putting in some public funds that allow private funds to come in, and using the returns on the initial investment to start a flywheel of capital for conservation. Eidson: I would fully echo that. It was about identifying ways to better focus and allocate NRCS spending to bring about greater conservation. The goal was never to make programs self-sustaining, but we realized that there are certain projects being funded through NRCS programs that have the potential to become self-sustaining. That would free up more funding for projects that are equally valuable from a conservation perspective. CFN: As an investor, which of the many opportunities outlined in the report do you find most exciting and why? Bayon: Getting people to understand the real potential of RCPP is an important opportunity for me. It is very clear that the Adjusted Gross Income (AGI) limitation is problematic for investment capital. If there is one idea that comes up time and time again, it is finding ways to get around the AGI limitation. That would require statutory changes to some degree, but RCPP already has the potential for an AGI waiver that is not being used as much as it could be. I am also excited about this idea of working with impact investors to create a revolving loan fund structure. This is something NRCS could do tomorrow if it wanted to and found an investor to work with. That has legs in the short term. In the longer term, the big wins probably require statutory changes. One of the interesting ideas there is the potential for NRCS and Farm Bill money to be invested as equity into technologies that achieve conservation. The model for that is the much-maligned loan guarantees that the Department of Energy puts out to companies developing renewable energy. People either love or hate them. If you hate them, you look to Solyndra as a failure of government policy. If you love them, you point to the overall program which has helped feed dozens of companies in the renewable energy space and made money for the government. The program has been as close to a win-win as you can find out there. There is the possibility to do something like that with agricultural or ranching technologies that generate returns. But under current statutes, NRCS cannot put money into company equity or provide loan guarantees to companies. If there was potential for this, it could be big. CFN: Could interagency collaboration factor in here? Bayon: Yes — another one of our findings was the tremendous opportunity for interagency collaboration, especially with the Farm Service Agency (FSA). This agency already has the authority to make loans to family-sized farmers and ranchers through the Farm Loan Program. These loans could provide money for one of the programs we address in the report, EQIP. But the Farm Loan Program has rarely been used. Why? We did not have the scope, time or funding to dig deeper on that, but there is a lot there that could be further explored. CFN: Of the case studies you profile in the report, is there any one example that you wish more NRCS personnel, producers, investors or other stakeholders were aware of? Bayon: There is a lot more you could do today with RCPP. It is bureaucratic and the transaction costs are high, but if investors understood RCPP, they could do a lot more. It is a unique program that allows investors to do big projects with NGOs and other entities. The Lyme Timber Company has already done a project with RCPP in the Gulf of Mexico. More investors could take advantage of that type of approach if they had the time, energy and ability to take on the headache. CFN: What is your greatest hope for how the findings are used? Bayon: I think there will be an effort to bring investors more into the mix of NRCS funding in lots of different ways. Maybe we will not achieve what is depicted in the Figure 2 illustration, but my hope is that we will come a little bit closer to it, and that we will see more private capital going into projects and practices that can provide a return. It would be a better allocation of public capital. In the short term, I would love to see something like this revolving loan fund because I think it would be extremely innovative. In the long term, I would like to see NRCS and the government be much more strategic in how it uses Farm Bill Title II money to better achieve conservation in lots of different ways including loan guarantees, equity investments, and all kinds of different tools. Note: Conservation Finance Network receives funding from the USDA. A representative of Lyme Timber Company is on our advisory board.